Deepdale Hall Farmhouse017684 82369work FarmhouseChris, Jimmy, Robyn and the twins Holly and Jessica will give you a warm welcome and ensure that you have a comfortable and memorable stay. Deepdale Hall is a 17thC Lakeland farmhouse, on working hill farm, with stunning mountain views, oak beams, log fires and breakfast cooked on the Aga. The lounge has a beautiful outlook over fells and woodland with the warmth of a log fire and an array of books on local history and walks to browse through. There is a colour TV and DVD's for that cosy evening in. There is a family bedroom to sleep 3 with en suite shower room and a double with a private bathroom just across the landing. Both bedrooms offer comfort and relaxation having period and unique furniture, fitted Herdwick wool carpets, some of the wool coming from our own Herdwick sheep!, facilities for a wide variety of hot drinks, TVs and spectacular views. A full English breakfast cooked on the Aga is served each morning, with a vegetarian full English available as an option. One double and 1 single bed, iron and brass beds, antique with modern base and mattress. Period decoration and fitted Herdwick carpet and en suite shower. Single £65.00 per night. Children priced at £1 per year of age if sharing with 2 adults. Stunning location and Chris was a great host. Comfortable, welcoming and a great breakfast. Highly recommended. Chris, Jimmy, Robyn and the twins Holly and Jessica will give you a warm welcome and ensure that you have a comfortable and memorable stay. 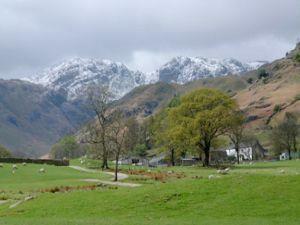 An ideal base for walking and touring the Lakes or just relaxing in a beautiful setting. Within walking distance of lake Ullswater with its steamer cruises, boats and many other activities, 0.25 miles from the road. Ample parking. Also Self catering . From M6 jct 40 follow A66 towards Keswick then take the A592. 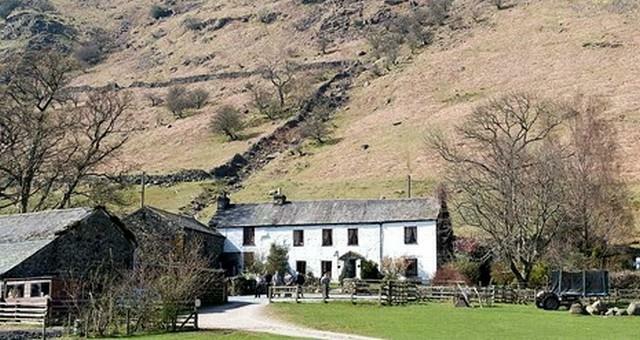 The farmhouse is on the A592, 1 mile south of Patterdale signpost on roadside. From M6 jct 36 follow signs to Windermere and then at mini roundabout take 3rd exit for Ullswater and Kirkstone Pass. We are 1 mile north of Brotherswater on the left after a red phone box. Public transport: bus from Penrith or Windermere.